By Mark - Malaysia - 26 Nov/03 - Viewed 2350 times. After checking back into the Sepilok Resthouse and having a shower we went back to the orangutan sanctuary for the 3pm feeding. This time there were even more people, most of them Malaysians as it was a public holiday. They seemed more interested in photographing each other than the orangutans and were making so much noise the only two orangutans looked really frightened. However, at five past three everyone left except us two and an English girl we were at Uncle Tan's with. Suddenly we were aware of a big male orangutan coming along the walkway behind us - it was quite scary until he swung up into the trees and back into the animal side. 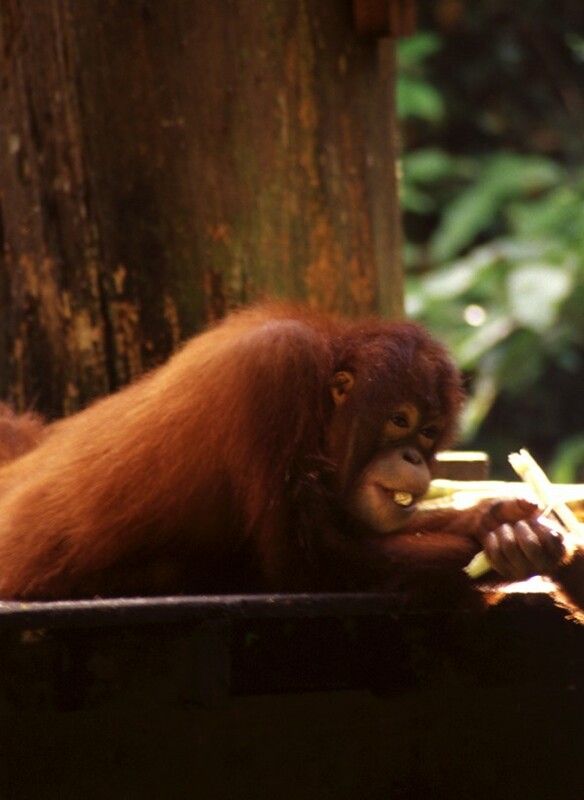 The other two orangutans were scared of him too as they quickly swung off into the jungle as he approached. After a while two more joined him on the feeding platform. We stayed and watched them until nearly 4:30pm - it was really worth coming back for and a lot better than the last time (see Trying to reach Sepilok). On the way out we saw a big red furry caterpillar that must have been three inches long and its head looked like a human skull. We went to have a late lunch at Banana Cafe in the grounds of the Wildlife Lodge. The gardens are amazing with lakes, bridges and huge fan palms. After dinner at the Resthouse we sat up late talking with the three others that had come back there from Uncle Tan's. The next morning we set off early for Brunei. We were travelling with Jimmy who we had met at Uncle Tan's and had stayed at the Sepilok Resthouse after. It was quite a long journey starting with a flight to Kota Kinabalu (RM95.00 each) which was worth it just for the view of the mountain, never mind the six hour bus journey it saved us. Then we got a taxi to the port (RM15.50), and just got there in time for the 10:45am boat to Pulau Labuan (RM34.00 including a port tax). This connected with another ferry to Brunei (RM24.00) and we finally got to the Sultanate at 3pm, sad to leave Sabah. Theoretically we were just a simple RM1.00 bus ride away from Bandar the capital but today was the first day of Hari Raya in Brunei (it had been yesterday in Sabah). This is because Hari Raya only starts when the new moon is sighted, and they hadn't seen it yesterday in Brunei. On the plus side it was a bit like having two Christmas Days in a row for us, but on the downside there was only one bus an hour and the first one was full. We finally got to the hotel we had booked at about 5pm and as we were very tired were delighted to find it was very nice with air con, cable TV and even a bath in our room.